I made some of these Mason Jar Soap Dispensers a few years ago, but in a different style, for my craft booth. 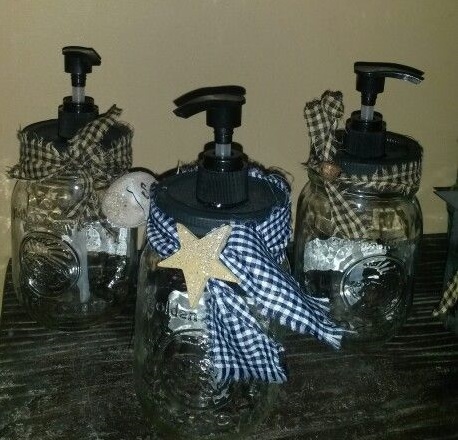 These I made in 2013 with cute homespun and wooden stars & rusty bells. And still today, they are great sellers. I guess mainly because of the cool, Mason jars. They are just so country and cute, everyone seems to love them. I know I sure do. Here is the basics of how I made these and what you may need. 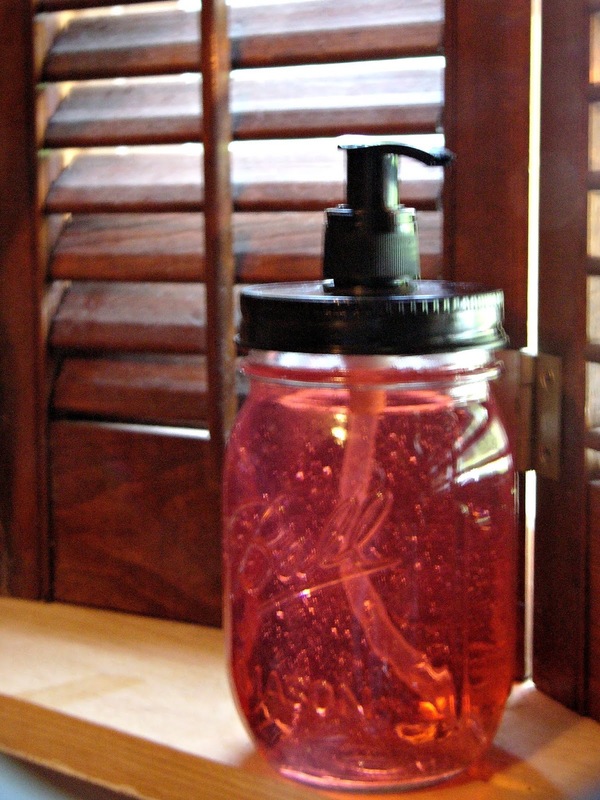 This is the $1.00 Silk brand soap bottle I bought so I could get the foaming pump for one of them. In the pic below, I'd already punched a whole and put the pump in the mason lid though. Here is where I needed a screwdriver to start the hole. so that when it went through, it would hit the crack. A drill would have worked, but I didn't have one handy and my husband was at work. But the screwdriver, hammer and pliers did the job. After the first couple punches. And then I started using the pliers to pinch it away and make the hole bigger. It really only took about 4 or 5 minutes. The lid metal peals back pretty easily. And then after I got the hole the right size, (remember, this one above is for a foaming pump which is a lot bigger than the regular ones,) I needed to glue it in place. Place the glue on the plastic and let it get all over the metal lid too. thing with that glue is that it needs to sit and cure for around 24 hours. So glue it and get on to other crafts for a bit. Notice my lids and rims are almost black. That is because I bought some Rustoleum spray paint and previously sprayed them a Rubbed Bronze color. I just didn't like the shiny gold, regular rims for these jars. They are a deeper, metallic, rubbed color in person. Way prettier than this pic looks. and stick the metal ring on to hold it in place. I finished it off with jut twine and a grungy tag I previously made. 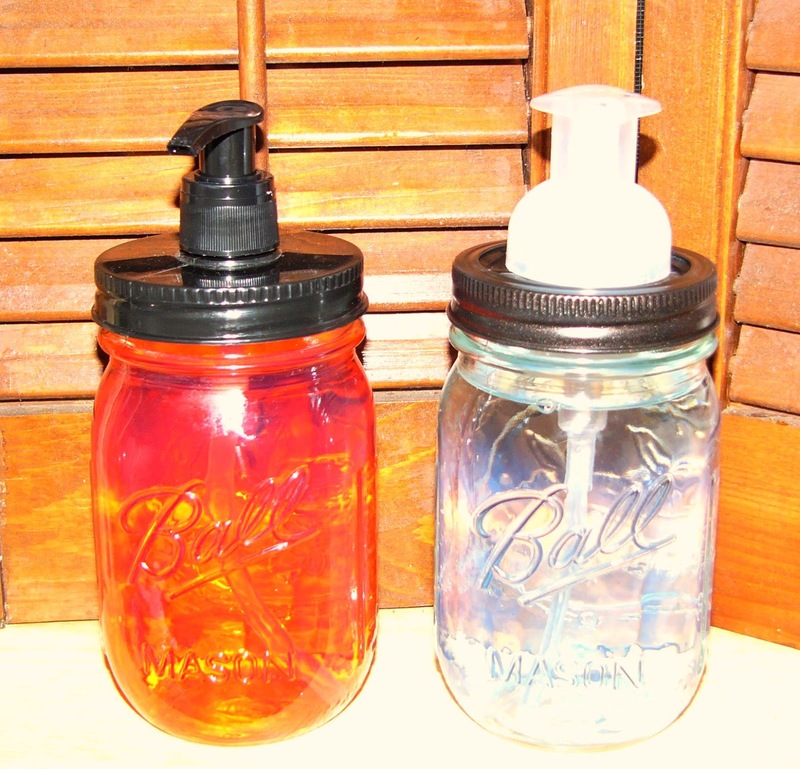 And then for the red one, I used one of those pre-made lids especially made for Ball jars. Here is the lid out of the pack. I got it at a Burkes Outlet store for a little over $2.00, but it wouldn't be cost worthy to buy lots of these for that price. So I will stick to making my own like above. I just had to pick a cute color for the soap, my kitchen is red, so I found some $1.00 Apple Crisp shampoo and used that. Just fill and stick it together. And that is all for that one! Notice this soap looks watery. It's because it is the foam dispenser pump. 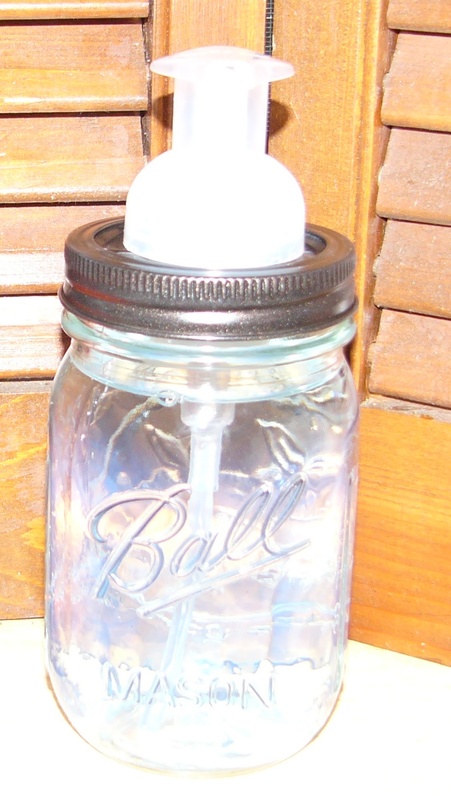 A very cute Mason Jar craft to do! I am keeping one of the red ones for my kitchen! I have a couple of these. I love them! Thanks! And I thought id give a try to a linkup like you do with fences. Maybe I can get some crafters to start posting and sharing those ideas too. I love these, do you sell these in your booth? If yes do you sell them empty or full?last question- how much would you sell them for ? Hi Lisa! Yes, I have previously been selling these in my booth in a more prim style with rusty stars hanging off them. (I may have done a post about them, not sure.) And yes, I have some in my CraftBooth555 on eBay for $7.99 and I have to sell them empty so I can ship them as cheap as possible due to weight. But i've found many cute colors of the $1.00 Shampoos at the Dollar Store that do great in these! Thanks much!!! Anything else, just comment and I'll find it.